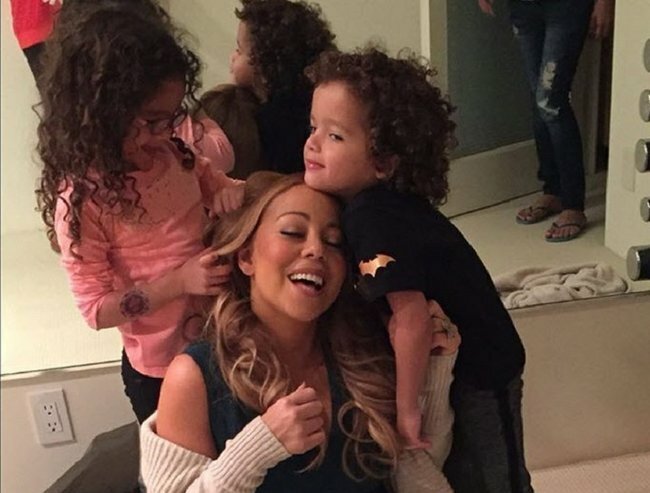 Mariah Carey wears a bathing suit in the shower with her kids. Hey Mariah. What's the deal with not letting the kids see you naked at bath time? I don’t know much about Mariah Carey. In fact, I can list what I know about her on one hand (with only four fingers). 1. She’s the favoured Christmas album of my local shopping centre. 2. She’s dating James Packer. 3. She wears lots of sparkly, spangled, stretchy clothes. 4. The word “diva” comes to mind. But I’ve learned something new about her in the past few days, something rather surprising. She refuses to be naked around her children. “It’s that one thing that used to be my private time, and now it’s not, but that’s okay,” she added. Mariah with her twins, Moroccan and Monroe. Image via Instagram. Her modesty, her fear of her own children seeing her naked is surprising. So surprising I was taken aback. My first thought revolved around those low cut spangly, tight, (practically naked) anyway clothes she wears. I mean what’s the difference really? But I fought it back maintaining my pledge not to judge what another woman chooses to wear and knowing it was half sparked by envy of how amazing she looks. So once I passed that initial (and to be frank slightly mean) assessment of the situation, I came to this conclusion. What the actual f**k? Her kids are four-years-old. Mariah’s twins, Moroccan and Monroe are the same age as my daughter, Emme. Four sweet years. Four-going on fourteen at times. But still four. I’ve had three four-year-olds now so I consider myself quite an expert of the four-year-old variety of our species. And this is what I have learned: Four-year-olds are needy, chatty and want instant answers and attention just like Mariah says. Four-year-olds will bust right in that door even if you shut it just quickly to change a tampon/wax your bikini line/de-fuzz your upper lip. But most four-year-olds I know actually don&apos;t take any notice of what you are wearing unless it’s sparkly or involves lipstick and high heels. Naked? Couldn’t care less. They are too wrapped up in the reason they busted in in the first place. A flick through photos of Moroccan and Monroe with Mariah shows a devoted, loving mother who, when caught unfortunately by hovering paparazzi, always seems simply a great mum. She seems like a woman proud of her femininity, proud of her appearance and confident of her body. So what’s the shame? What’s the fear of letting your kids see you naked? I have three kids aged from four to eight and I couldn’t be body conscious around them if I tried. Not that I want to be. When a six-year-old urgently has to tell you about the Zombie who killed him in Minecraft, not even a glass shower screen will stop him. My four-year-old is always casting aside her nightie to jump in the shower with me not even giving a second thought to the fact that her mother is naked. His two-year-old son – one of Perez Hilton’s two children — was grinning widely in the pic clearly thrilled to be having bath-time fun with Dad. But many, many, many were not so thrilled with Perez being called “creepy”, “odd” and even abusive. Stunned by the outrage, Perez took to the social media site to defend his actions saying that he actually had his “bathing suit on” and that he wasn’t even naked. The outrage was shocking for the fact there was outrage at all. I couldn’t imagine normal life in which children didn’t see their parent’s naked. Perez Hilton with his son in the shower. Image via Instagram. If you remember back to being a child, you will probably remember that around about the time you starting being aware of naked bodies was about the time you stopped seeing your parents naked. It’s a normal and natural evolution and most people will recognise when their child feels uneasy about it and start to close the door more. Carey&apos;s claims to bath in her cossie surprised me and actually left me with more questions that ever before. I mean, how does she go to the toilet with two four-year-olds around, what does she do when she needs to go and they are buzzing around like four-year-old flies? Mariah and ex-husband Nick Cannon with their twins, Moroccan and Monroe. Image via Instagram. How about when they are at the shops and they have to duck into the public loo? Does she blindfold them? What about when they are on the super Yacht with James? Don’t those things have like zero privacy? What kind of cossie does she bath in? A bikini or one-piece? Is it specially set aside for "bath time?" And most of all why? Shouldn’t we be hoping our children see the human body as natural and normal and nothing to be ashamed of? Do you think it&apos;s acceptable to be naked around your kids?